The legendary ‘hundred-gated Thebes’ has never before seen so much activity. Not only are there archaeological missions excavating, restoring and conserving monuments from environmental contamination, from humidity, sub-soil water and flood threat, but the city of Luxor itself is also being upgraded. There is a new promenade and arrangements have been made to improve the docking facilities for cruisers. In order to accommodate the influx of tourists, hotels of different grades have sprung up, a new resthouse has been opened near the Valley of the Kings. There is also Luxor National Day which is celebrated in November; it features a spectacular reenactment of the ancient Opet festival along with public lectures on archaeological and related subjects as well as folkloric entertainment. Strict ground rules have been laid down for tour groups, such as limiting size in relation to the tomb, and alternative itineraries have been worked out in order to ease the pressure on some of the most famous monuments. More options are also available as new tombs have been opened for the first time, three in the Valley of the Kings: Ramses VII (1) and Siptah (47) in the main valley, and Ay (23) in the western valley (page 106); the famous tomb of Nefertari in the Valley of the Queens (page 133); and six noblemen’s tombs (page 165). The need for a bridge to transport tourists across the Nile at Luxor has long been recognised. 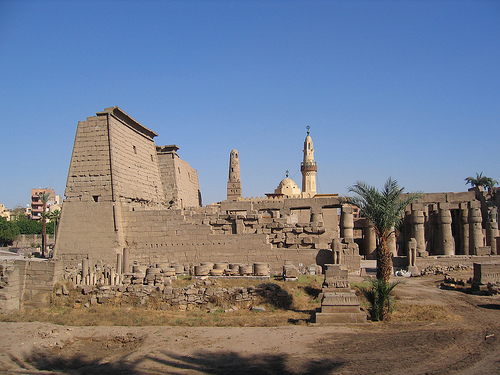 Nevertheless, its construction caused concern to environmentalists until the Minister of Culture officially declared the west bank of the Nile at Luxor as a protected area. The area runs from south of the bridge to well beyond Dra Abu el Naga to the north; no housing will be allowed here and kiosks and other tourist facilities will be strictly controlled. The community of Sheikh abd el Kurna, whose houses lie beside, and on top of, ancient tombs, will be offered alternative accommodation at el Tarif, to the north of the protected area. Resettling them will be difficult, because this is not the first attempt made to move them. In 1945, for example, a royal decree was issued to relocate them and architect Hassan Fathi was commissioned to design an ternative village. However when it was completed the people retus to move and Fathi’s ‘ideal community’ .was never inhabited. Even during the winter of 1995 when some of their houses were flooded and many collapsed, the residents refused to move; they chose to rebuild their old houses instead. One reason they gave for wishing to remain where they are, is that they earn their livelihood on the sale of alabaster artifacts and trade directly with tourists. An unvoiced motive appears to be the desire to hunt for relics for sale ‘under the counter’. Some of the Kurna residents have inhabited ancient (undecorated) tombs since before the Napoleonic expedition to Egypt. The tragedy of modern-day plunder is that the antiquities are lost to the world of art and scholarship, as they too often make their way out of the country, through antique dealers, and into private collections. The Egyptian government have clamped down on illicit digging, and have seized hordes of rare antiquities before they could be smuggled out of the country.